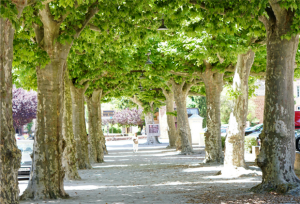 Lining city streets with trees reduces physiological symptoms of stress in humans. The thicker the tree cover, the lower the stress levels, study finds. We all know that a walk in nature can help slow the maddening pace of modern life and bring us back into the moment, but a recent study tells us just how many trees are necessary to keep us calm. 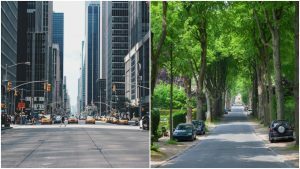 Researchers put people in stressful situations and then showed them 3-D videos of various “city”scapes, each with different densities of tree cover. The researchers, from the University of Illinois and the University of Hong Kong, subjected 160 participants to various stressful scenarios, including having them prepare to deliver a speech, or perform a math test, in front of judges and cameras. 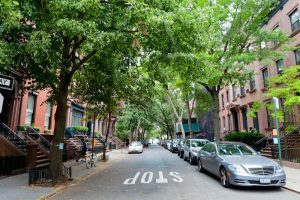 Once the participants were fully stressed out, they viewed one of 10 six-minute videos of city streets that changed only in the amount of tree coverage, ranging from 0 to 70 percent. Which image makes you feel more relaxed? What they found was the higher the density of trees, the lower the levels of stress the subjects reported. Inversely, the lower the density of trees, the less helpful the video was in helping the subject recover from stress. While this study, published in Environment and Behavior, was based on self-reported questionnaires, an earlier 2016 study, published in the International Journal of Environmental Research and Public Health, measured reduced physiological markers of stress in subjects simply looking at images of nature. The moral of the story? Spend as much time as you can in the presence of trees. The forest is our natural habitat. I’ll look forward to following your work. Am awesome article! Expresses everything I believe in- thank you! I would like to read more like this! In inland areas in north San Diego County, many of us are climate action activists working with local cities to apply this … to create cleaner air, cooler microclimates, and shade. In Escondido, our Mayor directed staff to do the BARE minimum necessary for CEQA compliance. The public wants MORE action than that, and a new mayor ! The Japanese call it forest bathing. Trees are one of the main reasons why I love the Appalachians and I’m hanging out in them as much as possible. Many studies reveal that in addition to needing food and good nutrition from fertile soils, people also need contact with nature for health and well being. While active work with plants and soils engenders a sense of well-being and resultant stress reduction in the gardening public, even the passive viewing of landscapes by non-gardeners can improve human health. A classic study conducted in a hospital showed patients recovered more quickly from surgery and required less pain medication if they had a view of a green landscape rather than the view of a brick wall. Other studies reveal that walking in a garden helps cancer patients recover, and that Alzheimer’s patients exhibit fewer violent outbursts. Also, children with leaning difficulties improve in their ability to concentrate when they are moved from areas with little or no green spaces to areas of increased greenery. Beneficial effects of viewing scenes of nature, as compared to urban scenes or hardscape, can result in physiological changes such as lowering blood pressure and reduced muscle tension. Some studies suggest that levels of greenness may influence the incidence of crime. The practice of using plants as tools to rehabilitate people with disabilities has matured into a discipline known as horticultural therapy and the concept of designing healing landscapes at hospitals, hospices, nursing homes, and urban environments has matured into the allied discipline known as therapy landscapes. Yet the healing factor of healthy landscapes has not gained the broader attention of soil scientists, agronomists, and farmers in managing much of the earth’s land resource, even though healing landscapes are rooted in soil. Beyond food production and the usual environmental issues, soil scientists and agronomists may find new opportunities by asking and researching questions about the influence of lifeless appearing landscapes resulting from tillage, herbicides, and cropping regime on the aesthetic value of landscapes and its potential impact on the physiological and psychological health of the viewing public. Heckman, J.R. 2012. Human Contact with Plants and Soils for Health and Well-Being. 14 pages. In E.C. Brevik and L.C. Burgess. (ed.). Soils and Human Health. Taylor and Francis. Ummmmm…… ya’all aren’t much familiar with the joys, the wonders to be had from too many trees, too much rainfall, the by-products including hyper stress-inducing, omnipresent, ugly, sickness producing mold…. No longer just the privilege of western Oregonians, folks all across Virginia and the Carolinas know of it oh so well in 2018….. And then there’s the issue of what happens when your trees around house get sooooo very tall, they start snapping off in winter ice, or summer thunder storms, and you worry through the night, instead of sleeping, terrified they might come crashing through your children’s bedroom…. But you go ahead, stick to the Pollyanna good news fluff about trees, trees & more trees. I luv ’em too…. But there are times when trees can be every bit as stress inducing as good ole Montana prairies.